In Kadmos, volume 44, L. Kontorli-Papadopoulou – Th. 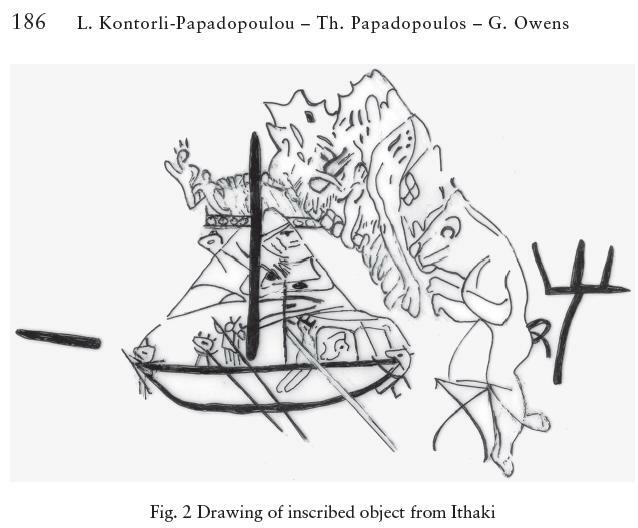 Papadopoulos – G. Owens shed some light on the Minoan past of the island of Ithaki. It is truly fascinating to know that the Minoan world stretched both that north and west. What is being discussed in those pages is the Linear A sign SE (AB09) , which appears on an inscribed object from Ithaki. However, nothing is being said about the carved representation of a ship and the weird dog-like creature next to it. What is that really? Could it a representation of the mythical encounter between Odysseus and Scylla?